I have an admittedly schizophrenic love-hate relationship with the website that pays my mortgage. I was hired at my current employer specifically to help develop a Web presence. Talk about a leap of faith; I was hired as a webmaster by an organization that, at the time, did not actually have a website. Anyway, exactly a year of bartering, bickering, and bellowing later, we unveiled the official new organizational website. In the five years that have followed, I've called it many names (usually unflattering), because it's the one website that I work on that's designed by committee.2 And you know the old joke that a camel is a horse designed by committee? It's absolutely true, I'm here to attest. So, for years, my primary nickname for it was "Joe Camel. "3 As time went on, however, the camel moniker began to ring a bit hollow. It just didn't convey as much of either the mockery or the bitterness as I would have liked (and someone could have misunderstood "Joe Camel" to mean that I thought the website was smokin'!). That led to my next great comparison beginning a couple of years ago: The Landfill. This came about because at some point someone decided to make the Web a primary communication vehicle without giving a lot of thought to being selective about it. It seemed appropriate for the time. After all, the website was a passive thing, just waiting for a bunch of people to come along and throw stuff in it. Of course, landfills are both carefully planned and constructed, so the metaphor began to break down pretty quickly.4 So I began searching for a new metaphor/epithet by which to voice my sense of ennui regarding the website. I am pleased to report that, thanks to CNN, I have found the perfect metaphor and nickname all wrapped up in one tidy package: Hogzilla. First, let me share the background story on this. Back in July of 2004, on a plantation near Alapaha, Georgia, a man claimed to have shot a 12-foot-long wild hog weighing 1,000 pounds. He took a picture of the dead hog before he and the plantation owner buried it on the property. The picture causes more controversy than it solves, because the hog is strung from its hind legs, and the man is standing in a pit and slightly behind the hog, all of which makes the carcass look bigger than it actually is. 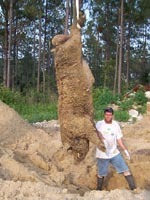 The National Geographic Society even sent a team down to southern Georgia to exhume the corpse; they estimated it to be a 7-foot-long feral hog in the 800-pound range. But to the folks of Alapaha, Georgia, who obviously needed some form of mascot, the creature became affectionately known as "Hogzilla" and earned its own festival5 in November of 2004. So when I encountered this story, after savoring it for its own sake, it struck me that a large, somewhat exaggerated feral hog was a perfect analogy to the website in question. Hogzilla, after all, runs wild, can display a nasty temper, and eats whatever it can. Hogzilla must be fed at all costs. And Hogzilla isn't very picky about its diet. To top it off, if you substitute all the people6 who don't understand the website for what it isor what it could befor the townspeople of Alapaha, celebrating a false idol, the metaphor works on multiple levels. See, the original goal of the organization was realized early: we wanted a website, and we got it. Well, let me be the first to say, "mission accomplished." The problem is that the website has never been allowed to have a more evolved purpose. While I was busy advocating a mission statement that involved the education of an historically undereducated audience, everyone else in the organization was trying to come up with ways to outdo for-profit websites while spending like Ebeneezer Scrooge. There's nothing that a webmaster of a not-for-profit organization with no definable Web budget likes to hear more than "Well, I just saw this on the Web. Why can't we do that?" Or, even better yet, "The boss saw this on another website and wants it on ours. I told her that we'd have something for review by Friday." Since management A) didn't have an elaborate purpose in mind, and B) deluded themselves into thinking that quantity would suffice for quality in information, we ended up with Hogzilla. The website started as a pig7 and has grown ever since. Like Hogzilla, the website has grown bloated and difficult to handle. Hogzilla demands to be fed with fresh information, although the organizational culture is such that no one wants to be the one feeding it (have you ever tried feeding a wild hog?). In fact, I do believe that any day now, Hogzilla will begin demanding human sacrifices. Five years as the keeper of Hogzilla has taught me one thing, at least. A website is best when it only serves one master, sort of a benevolent dictatorship. It may be way off base, but at least it will be consistently off base. Otherwise, it will become Hogzilla, refusing to yield to any one person's desires, an ugly, bloated, feral hog in the information wilderness. I have seen Hogzilla, and our fates are inexorably twined. Unfortunately, neither of us can survive here without the other. Now, if you'll excuse me, I can hear Hogzilla grunting nearby. Hogzilla must be fed, after all. 1 The Man is a composite archetype of anyone in a position to make my life troublesome by creating work that they are neither equipped to understand nor accomplish themselves. They usually pay no attention to whether or not the work in question actually solves a real or perceived issue and respond to questions about said work with useless aphorisms like, "Work smarter, not harder." The Man also keeps me down by making me financially codependent upon him. 2 Design by committee doesn't even really do that process justice. By the time any idea gets past our Legal and Compliance departments, then reverts back to individual managers for review, the resulting hodgepodge frequently looks like it was written, designed, and laid out by a color-blind monkey. And thanks to the contributions of a print designer with no direct experience in creating websites, the website template is such that I am quick to point out how little I actually had to do with it. 3 It would have been easier to name after a famous dog, seeing as there are so many of those (e.g., Rin Tin Tin, Benji, Toto, Cujo), but that wouldn't make any sense given the horse/camel comparison. Because there is truly no such thing as a celebrity camel, I was forced to use a cartoon trademark that existed solely to market cigarettes to teenagers. Just another reason to pick a better moniker, in my opinion. 4 More quickly than refuse in a sanitary landfill, but not quite as quickly as material in a compost heap. Come to think about it, a compost heap might have made an even better metaphor than a landfill, except that a compost heap generates a useful byproduct. 5 The inaugural Hogzilla Festival of November, 2004, featured a hog-calling contest, a greased-pig chase, and a float featuring a life-sized replica (depending upon whether or not you believe a hunter from Georgia or the National Geographic Society) of Hogzilla. 6 Usually at the mid-manager level or above. You know, the type to whom nothing is impossible because they don't have to do it themselves. 7 Reallyif you don't believe me, back in 1999 when we were starting the discovery phase of planning the website, my direct supervisor said in response to one of the proposed content ideas, "We are going to have to slap a lot of lipstick on that pig." It seems eerily prophetic, although the pig now requires not only lipstick, but blush, false eyelashes, and a wig to boot.